Andoh spent the 2011-12 season at FC Porto, helping their youth side to an under-19 championship. 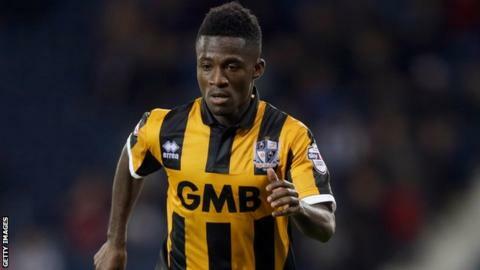 Port Vale winger Enoch Andoh is likely to miss the rest of the season with a serious knee injury. Andoh, 22, was hurt in Vale's 2-1 defeat by Colchester and a scan has revealed damage to his anterior cruciate ligament. "It's not great news. He's got quite a significant injury to his knee," manager Rob Page told BBC Radio Stoke. "It's one that's going to put him out for a considerable amount of time - probably the rest of the season." Andoh joined Vale on a free transfer in November 2014 and had impressed Page with his recent performances. "He's bitterly disappointed. He was just starting to find a bit of form," Page added. "We've seen a specialist and we're going to get a second opinion - for him as much as anything else. It's a blow. He was bright spark for us." Page, whose side are 17th in the League One table, has not ruled out adding to his squad. "If there's business to be done, we'll go and do it. In the longer term, if we can't get somebody from within the squad we might have to do some business and bring someone in," he said.